Please check your email account for updates on the annual membership which is now due. 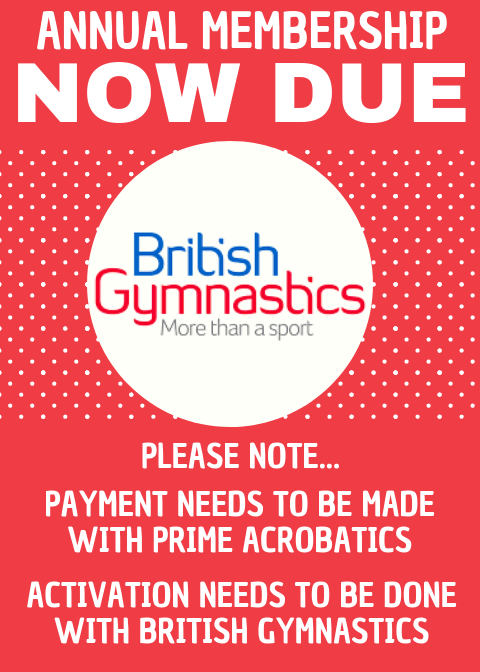 Your annual membership payment includes your child’s insurance with British Gymnastics (BG) and will cover from 1st October 2018 to 30th September 2019. Payment for your annual membership must be paid directly to Prime Acrobatics. This can be done at our front desk, over the phone or via bank transfer (please contact us for details). All new members joining Prime will need to create an account with BG to activate their child’s/children’s insurance. This can be done by clicking HERE. For those renewing their membership you should have already received an email directly from British Gymnastics with instructions on how to renew. Keep an eye on your inbox and simply follow the email link. (Please also check your spam/junk folders). If you have not received an email then please login to your account via this renewal link. If you have any issues with the BG website then please contact British Gymnastics directly on tel: 0345 1297129. Please do not hesitate to contact Prime if you have any questions or queries.